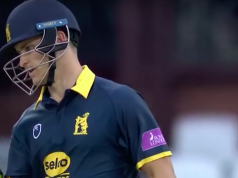 Yorkshire will welcome back their international stars as they look for the win that will virtually seal qualification to the Royal London One-Day Cup knockout phase, while nothing but a win will do for their hosts Northamptonshire. Four wins from five have taken the White Rose to the top of the North group, the only defeat coming at Worcestershire on Friday, with those two sides looking likely to battle it out for the direct place in the semi-final that comes with top spot. As England look to get as much 50-over cricket into the Champions trophy line up, the likes of Joe Root, Jonny Bairstow and Adil Rashid have immediately returned to county duty leaving a 13-man squad featuring eight internationals, including Peter Handscomb, who’s 140 on Sunday followed Bairstow’s 174 against Durham last Wednesday. For Northants meanwhile, the competition has proved something of a struggle after finishing top of the North Group last year. 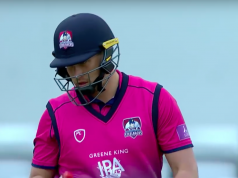 Sunday’s defeat at Durham leaves them with only one win, and a tie, from their five games. Anything but victory tomorrow will end their chances of making the top three, and even if Alex Wakeley’s men win all three of their remaining fixtures, nine points may still not be enough to qualify. They do welcome back Ben Duckett from England drinks carrying duty, but will be ruing Sunday’s 19-run defeat, as well as the tie against Worcester, as three points that got away. Northants will be hoping Rory Kleinveldt can return to provide much needed balance to the side. Richard Levi came into the English summer having been named player of the tournament in South Africa’s domestic One-Day Competition. He has carried that white-ball form with 242 runs in four innings, including a century at Derby and two further half centuries. If Northants are to match the international experience of Yorkshire’s batting line-up, they will likely need Levi to fire. There was much frustration around Headingley when Jonny Bairstow was forced to miss the opening two round of Championship matches, but the England keeper batsman has been in blistering form over the last week. His quick-fire 72 for England against Ireland following a remarkable 174 off just 113 balls for his county and Bairstow will be hungry to keep piling on the runs as he looks to force his way into the starting 11 for the Champions trophy. Northants add the returning Ben Duckett to a 15-man squad, but could rejig their batting line-up after Rob Newton replaced Duckett in the opening spot and hit a century against Worcestershire. Rory Kleinveldt is again named in the squad as he awaits a return from full fitness, whilst Nathan Buck could also come in if Northants continue to rotate their seamers as they have done so far. Yorkshire welcome back Joe Root, Jonny Bairstow, Adil Rashid, Liam Plunkett and David Willey, all five having played for England in the ODI’s against Ireland. With them returning they have taken the opportunity to rest both Tim Bresnan and Matthew Fisher. Wantage Road has seen two bitterly cold evenings so far in the One-Day Cup so Northants supporters will be relieved to see temperatures set to reach an almost balmy 15 degrees on Wednesday evening, with pitches tending to provide high scoring games white-ball games in recent years.